It is important to mind the buttermilk. Only add enough to bring the dough together. The amount will vary greatly depending on the milk’s fat content and the general humidity. Next time I will try refrigerating the dough 10 minutes before baking. [March 7, 2010 UPDATE] Retried biscuits with reduced-fat buttermilk to find that it required about the same amount (3/4 cup). Reduced butter to 1/2 cup and added 1/4 cup vegetable shortening. The texture was slightly more tender, but not enough for me to switch from the all-butter. Cooking time increased dramatically. If using shortening, add 1/4 teaspoon salt. In fact, the recipe has been adjusted for slightly more salt. [June 13, 2010 UPDATE] Biscuit recipe performed better in the winter. Lately, they haven’t been so hot. The butter’s fat leaks out while baking and haven’t come out as fluffy. I’ve tried all different types of butter, as well as grating it rather than processing. Yesterday I added a bit of baking soda to some success. Pre-heat oven to 450 degrees and line a baking sheet with parchment paper. Cut butter into 1/2-inch chunks and freeze 5 to 10 minutes. Mix dry ingredients. Add butter and process in a food processor until butter pats are pea-sized. Pour into a large bowl and add buttermilk, adding additional until dough just comes together. Turn dough out onto a well-floured surface. Pat or roll into a 1/2-inch-thick disk and fold in half. Repeat rolling and patting once. Cut with a 3-inch glass or biscuit cutter, re-rolling scraps once. Bake biscuits on prepared baking sheet 15 minutes or until golden brown. These are some of the best biscuits I’ve ever had in my life. Add a little cheese and I’m in heaven. Go make some biscuits! I’ll look back at the recipe variations to see how much cheese I used to call for. My guess is 1/4 cup grated sharp cheddar. Dan, that photo blows the biscuits from “The Flying Biscuit” out of the MF water! 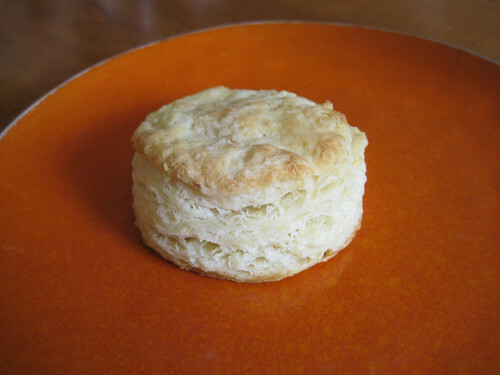 They’re good biscuits, but not as good as my mom’s, FB’s biscuits that is, but your biscuits just conjour up pure Southern cooking at it’s best. Mega kudos!